Advance booking for Salman Khan starrer Bajrangi Bhaijaan opened to a phenomenal response. The first weekend shows already 70% booked three days prior to the film’s release. In most circuits, advance booking opened this morning and since then, tickets have been selling like hot cakes. Distributors feel by tomorrow, the first week will likely be all sold out. Bajrangi Bhaijaan, which will release in 4,500 screens all over India, is a veritable Eid treat for the actor’s fans and movie-goers in general. The film, Salman Khan’s first mega-venture as a producer, also features Kareena Kapoor Khan and Nawazuddin Siddiqui, with Khan playing the title role. It is expected to turn into bumper business over the weekend. According to the Box Office India, here is the complete advance booking report. Everyone is eagerly awaiting the release of Bajrangi Bhaijaan. Since Salman Khan and Kabir Khan have teamed up, expectations are higher than usual. I have never witnessed such a frenzy for advance booking. All-India, advance booking is 75 per cent at both multiplexes and single-screens, and in Mumbai, it is 80-per cent and growing. It is safe to say that this film will create enormous box-office records. The weekend shows are almost already booked. This film will definitely break records that were created earlier this year and has been assigned 4,000-5,000 screens all-India and over 1,500 in Mumbai. The film has seen 70-per cent advance booking and the number is rising as we speak. Bajrangi Bhaijaan is expected to be one of the biggest grossers of all time. I have never seen advance booking like this before. For Friday, seats for all five shows in every multiplex are filling up fast. The film is set to release in 4,000 screens all-India and 300-350 screens in Delhi-UP. Advance booking for Bajrangi Bhaijaan is extraordinary. Usually, in Punjab, advance booking doesn’t draw much of a response as there is a cinema hall in practically every locality. The opening of Bajrangi Bhaijaan will be huge as everyone is waiting for Salman Khan’s next film. It is set to hit around 100 screens in East Punjab. Today, we witnessed a huge response for the advance booking and by tomorrow it should be 100 per cent for the weekend. In fact, a few single-screens are already house full for the weekend. The advantage Bajrangi Bhaijaan enjoys is that there has been no big release in recent times and audiences are eagerly waiting for this film. It will definitely break records and create new ones. The film will open at 180-200 screens in West Bengal. 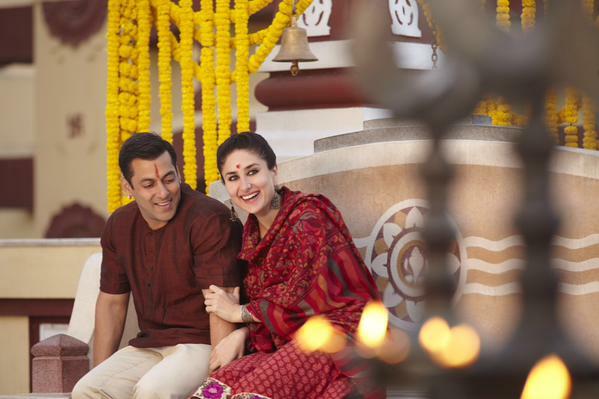 Bajrangi Bhaijaan is all set to break the record for advance booking. It is only Wednesday and, after advance booking opened in the morning, the response has already been been marvellous. Sixty per cent tickets have sold for the weekend. The film will release at around 175 screens and undoubtedly will be a record-breaker. Advance booking is yet to commence in Mysore but Bajrangi Bhaijaan in general has a very strong buzz. As always, Salman Khan is giving his fans a perfect Eid. Advance booking will start this evening and by the looks of it, the response will be nothing short of spectacular. The film will open at 60-65 screens in Mysore. Are mereko saturday tak intjar krna préface…. @ TO watch BB… SO sad !!! i am u big fan.